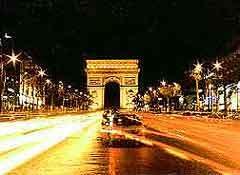 Paris attraction-guides.com - Paris, France attractions guide featuring Paris, Ile-de-France Avenue des Champs-ƒlysŽes information, including description and general Paris, Ile-de-France, France FR Avenue des Champs-ƒlysŽes information. - Last updated 30/10/2012. The world-famous Champs-Élysées symbolises the style and joie de vivre of Paris. This wide, tree-lined avenue is home to the city's chic restaurants, shops and boutiques and extends from the Arc de Triomphe. This magnificent boulevard is known for its concentration of high culture, although nowadays fast food outlets, car showrooms and cinemas can also be found here.